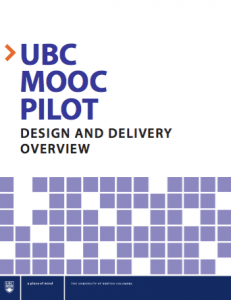 I recently pushed out a design and delivery report on UBC’s initial MOOC pilot. Over 8,100 students earned certificates through the first round of these open-access courses. Learning materials from the MOOCs have also been used by UBC students in credit-bearing courses. Additionally, instructors made efforts to facilitate the reuse of their learning materials through the use of Creative Commons licenses and the transferring of content to additional platforms beyond Coursera, such as external YouTube channels. You can download and read the full MOOC report here (direct PDF link). Additionally, Tony Bates has also added some thoughtful commentary in his blog post entitled What UBC has learned about doing MOOCs.